Oh how much my life has drastically been altered since the arrival of our boy Cloudy, the siberian husky. I have never expected to own a husky. Ok, I admit I wanted to one day own a large breed dog and possible a Golden Retriever. (Guilty, I still one day want one too). But a siberian husky is entirely alien to me. I heard so much that is a difficult breed and the amount of people have the perception they can only survive in cold areas. *one thing they missed out is that Huskies learn to adapt* They never bold this and enlarge the font size. Fast forward. 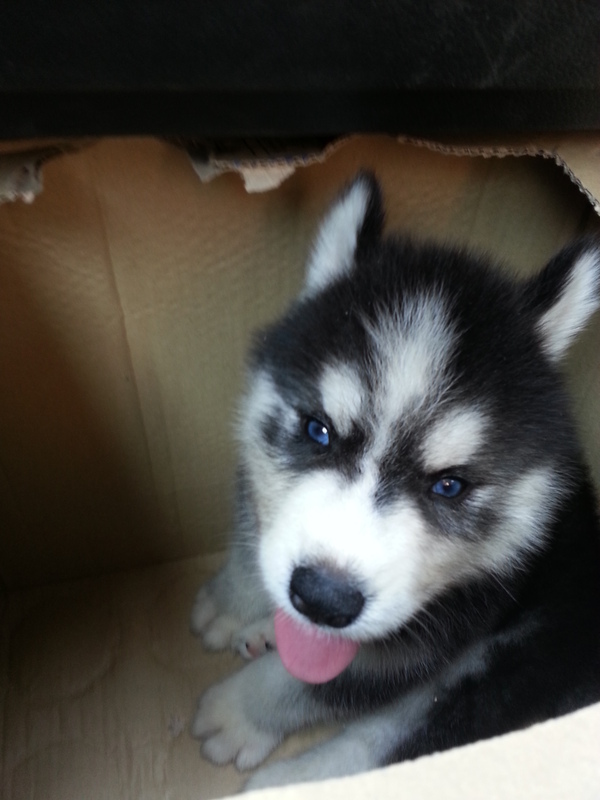 I got myself we a husky. Look at that cute face! How can you resist right? Yeap, that’s just the beginning. 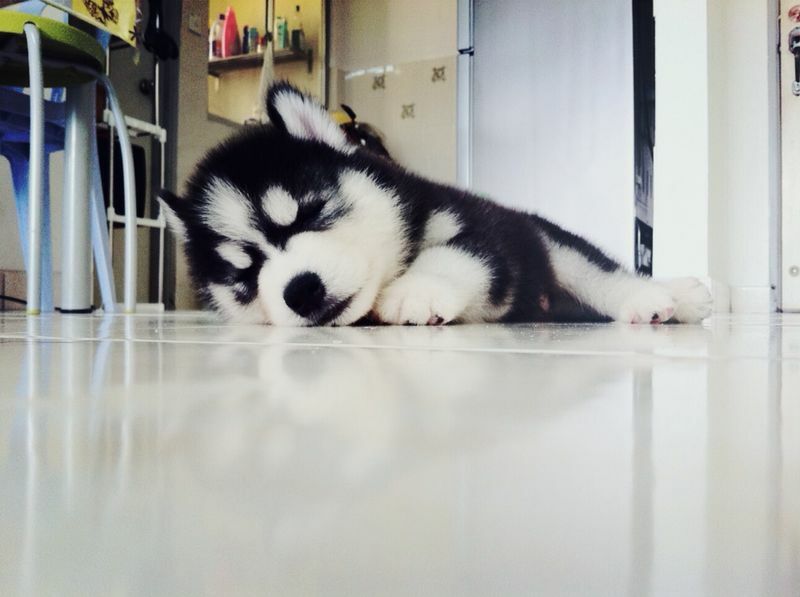 I know is not gonna be easy having a dog, more so a Siberian Husky. I underestimated myself thinking that I’ve been around dogs almost my whole entire 27 years of life (from strays to pure breeds maltese and etc.. ). I was totally wrong! This cuteness overload creature is a whole new different level. The first day, he was just this tiny 2KG thing, and we was sick. Real sick. Barely 7 weeks, he’s gone to 3 doctor visits. FYI we got him at an expensive price (what do you expect? a free husky?) and adding on top his medical and vaccination bills. tips to readers: if you ever having a thought for a husky, please consider his medical bills. I’ve for sure have totally overlooked this. Now, come to the point how my life changed? Well, firstly I have a non expiry alarm clock! Cloudy, wakes me up 7.30am sharp. Yes, since the day we brought him back. It started with making little noises when he’s a tiny pup. It had then evolved into pounding and biting us, then barking and then now to the whole new level of staring at you and WHINE! He whines like a real baby! I never know got to know that dogs will eventually grow to expand their needs. I have a maltese and it doesn’t demand so much from me. As Cloudy grows, he got so much energy he needs to let out. He was throwing tantrums and all. And so, this come to the beginning of daily walks and weekend park-going. Even if i missed a day, i know i’ll expect chaos the next day! And so, number 2 changes, I have a personal health trainer! 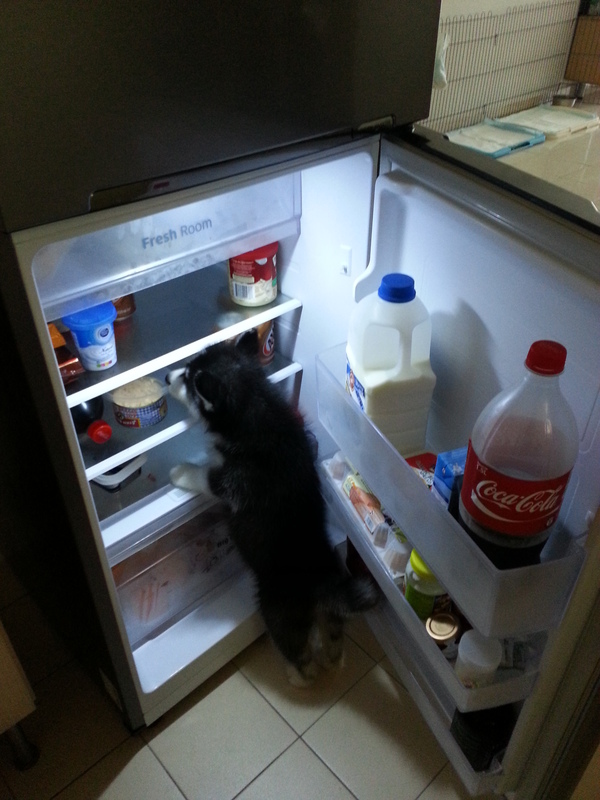 I guessed when I was doing research, they kinda missed out that Husky pups needs food. And i mean a lot of food eventually for them to have a proper growth. Oh and they did state that they need specific diet. I was like WTH, Cloudy can adapt and should adapt to my lifestyle. Little did i know, I was totally wrong! He indeed do need proper diet. Why I say so? Nevermind the cost of his food (which usually goes up to more than RM100 a month), he needs sufficient protein and meat.. MEAT i repeat. Cloudy can’t have too much protein. Though he needs protein badly for better growth, but he can’t have too much because you’ll know from his poops. He definitely need meat now, specifically raw the better! RAW, sounds really gross. I still cannot accept my dog having raw meat, so I decided on half raw half cook. That’s the best i can do for now. FYI, he eats like a monster too btw. So yes, no.3 we have Cloudy with the stomach of a wormhole and having me stressing on his sufficient diet almost daily. Oh and remember the alarm clock thing? He has a set feeding reminder too! 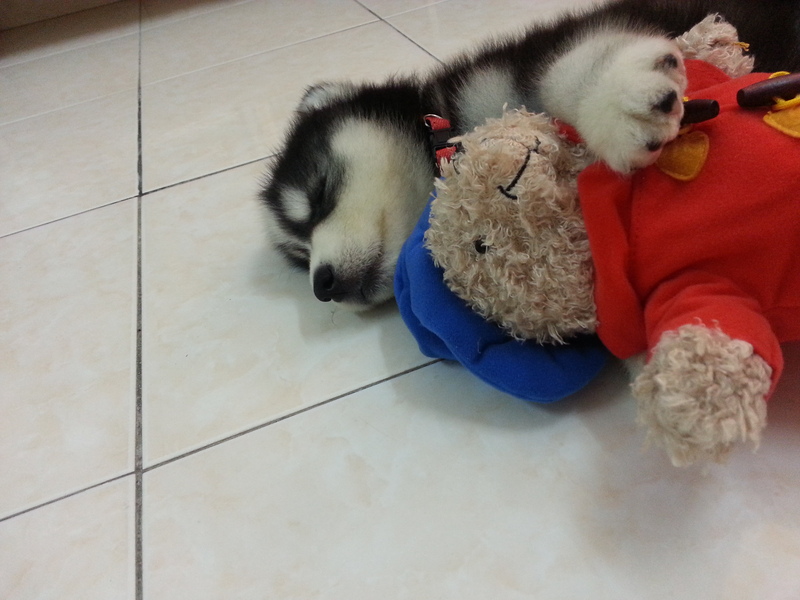 I kinda expect that Husky has a very different sort of personality. Again, I’m guilty of underestimating. Boy oh boy! Cloudy sure does have lots of personality. Good and bad I would say. There are times where he’s such a sweetie pie sleeping with his tongue sticking out. His good times where he will just stick right next to you when you need a warm cuddle and the times where he’ll accompany you in your toilet helping out with your business. *this is too much information right? * Now come to the bad temper problem. If Cloudy is a child, i would definitely send him for anger management issues. He does have temper issues. He gets angry and pee right in front of me in purpose when he dislike what i just did to him. For example, brushing him for too long. 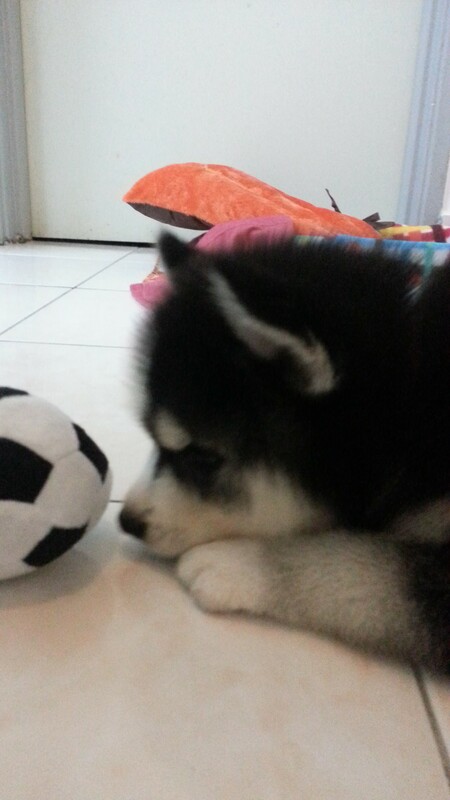 There are times when we try to train him to stop biting so we hit him hard, and real hard and he’ll just sit one corner sulk and will not come to you for like the whole day. And my, his face that he shows you, really does make you think hard if he’s a human boy trapped in a dog’s body. He does have separation anxiety too, he messed up your house not just with his pee and poops but taking down your favourite books, plants, pillow and multiple toilet rolls! I’ve heard worse now from other owners. Ranking at no.4, I have a destroyer human boy like puppy i have to deal with everyday! We all know Husky have thick coating. Oh yea, same as shih tzu, chow chow, maltese, and other long haired dog that manage to survive in our local weather. 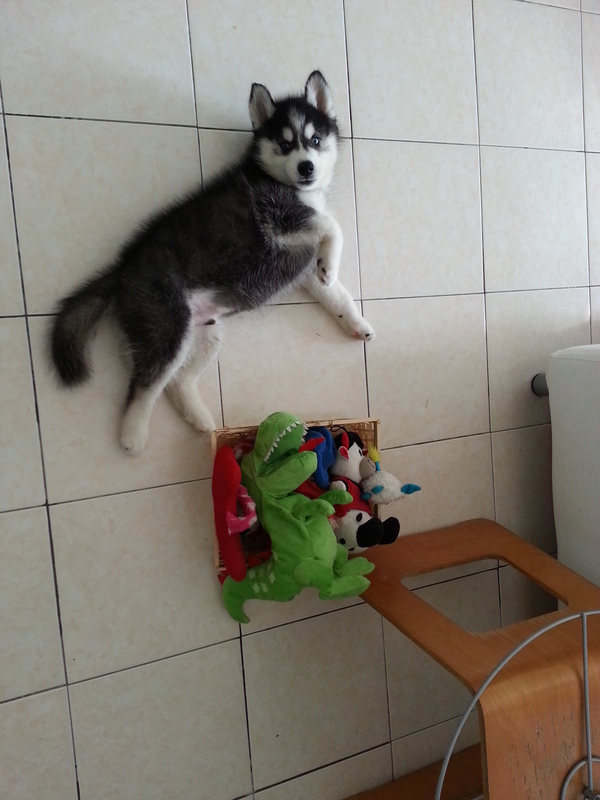 But little did I know when people tell me that Siberian Husky sheds alot, i didn’t expect it to be this ALOT. Cloudy now have not even reached the annual husky shedding. Just shedding off his puppy fur. And having said this, I can say… is a whole new level again. You’ll see your house having knotted grey fur flying around whether you’re watching tv, reading a book, cooking or just minding your own business. Every corner of the house has at least a ball of fur residing there. I have tried to eliminate this by brushing Cloudy everyday. I repeat.. everyday! I have never been this discipline before in my life where i really routined myself to do this twice a day , or at least once if i’m busy with work. And adding to the brushing, i have to clean his toilet area and vacuum my house so that I won’t accidentally choked by his fur. And so, at no.5, I have a lifetime discipline teacher for at least 15 years. You can also say that i’ve just applied for a slave job to my own dog. I am actually an introvert. I don’t really socialize or hang out with people my age often. Since I don’t go to parties, shopping malls, clubs or etc, you can say I’m kinda anti-social among my friends already even before I gotten Cloudy. But now, I’m even more of anti-social? How you may ask? See, I’ve became this paranoid human being. Like a mother worried for her child, my mind is constantly with Cloudy. Even i know when Cloudy is within his daddy’s care which I usually felt more relieved, i still worried he might have some trouble. So I clocked in more hours caring for him and worried about him. 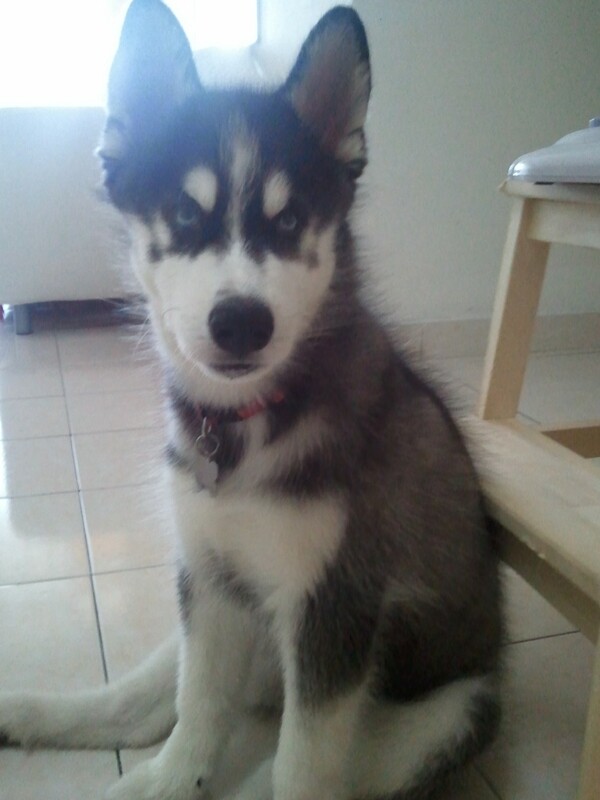 The amount of play time, strict feeding time and dealing with his behavioral problems, i usually want to go home on time and make sure he’s fed and well before i leave to hang out with my friends which usually comes to about 8 – 9pm.. Also, because of my paranoia, i became an active member in the Malaysia’s Husky group on FB. I’m constantly on it to check on other huskies who share the same behaviour like my dog and sharing information. Like how a mother would do with other mothers WTF! 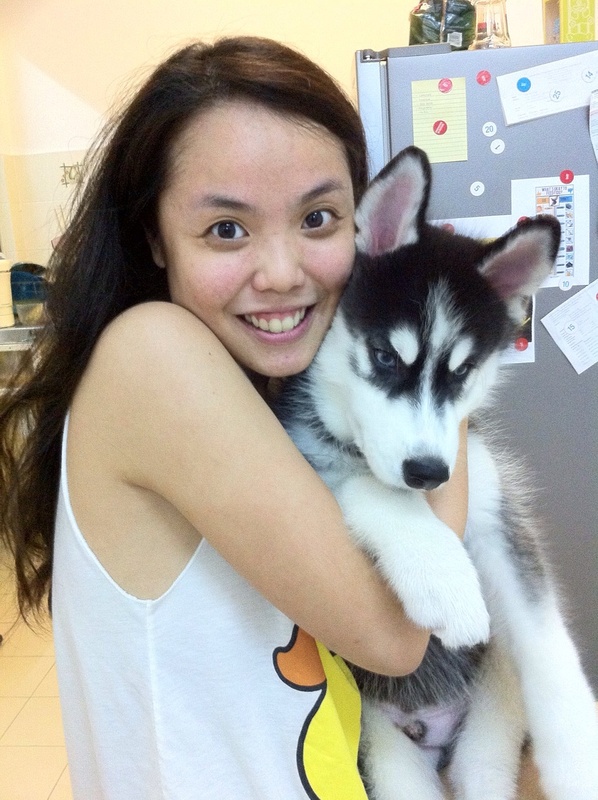 Here in no.6, I am becoming a siberian husky expert all of the sudden. Despite all these changes. The biggest one I’m currently experiencing is JOY! I have never felt so attached to a dog before. Yes i’m a dog lover, a sucker for any cute animal and a maltese owner. My maltese Dee Dee is stil alive at age 14 and still doing well. If you want me to compare my attachment, I’m more emotionally attached to Cloudy. Maybe because he was a weak little pup or maybe he has this very charming character. I don’t know, but every inch of my free time and every conversation I had with his daddy will surely include him in as well. Is like, he’s becoming part of me. I even planned for his .. my future. 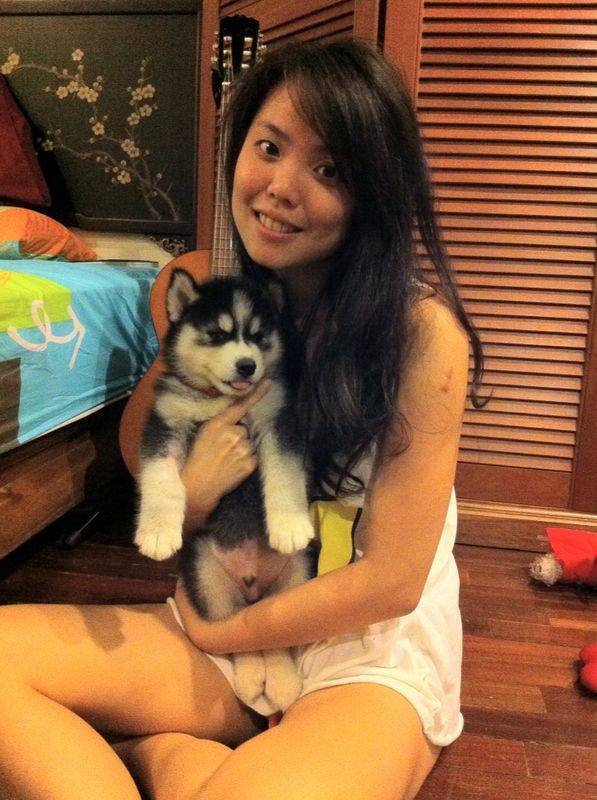 I came to think so far, how to make a husky get a long with a new baby. Not that i’m married or pregnant or anything yet but i’m already thinking WTF! No.7, unconditional love is what I’m learning each and everyday. Its like I’m going back to being a student again because everyday im experience new things and new joy from this little pup. I love him to pieces even if its just 3 months with me! My sweet giant Cloudy, please continue to fill me in with your new adventures! p.s. i’m writing this to remind myself how much happiness I currently hold. And I want to remember this moment always.